Gazing into Buffalo's night sky has its challenges, with substantial light pollution and moisture in the atmosphere generated from Lake Erie. But for students taking Descriptive Astronomy (Physics 121-122), spectacular sights like the Horsehead and Ring Nebulae soon will become routine. Bernard Weinstein takes a look at the sky through the newly installed Catipovic telescope, which will offer astronomy students at UB a much better view of spectacular sights like the Horsehead and Ring Nebulae. In June, a 20-inch telescope was installed in an observation dome on the roof of Fronczak Hall, North Campus. The telescope operates as a transit telescopemoving along only one axiswith all-night, real-time, star-viewing and image-storage capabilities. It has higher light-gathering and resolving power than the commercial, 10-inch telescope that the 150-160 students enrolled in the beginning astronomy course had been using on the Fronczak rooftop. For Bernard Weinstein, professor of physics, the installation of the Catipovic telescope was the culmination of years of trying to find a stable site for the telescope, which was donated to the university 20 years ago. The project came together this spring, in large part due to a $40,000 gift from the son of the man who originally donated the telescope. The money was used to help with site preparation and installation costs. 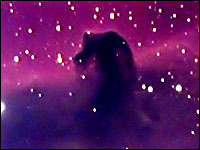 The Catipovic telescope will be able to provide astronomers with a view of the Horsehead Nebula similar to this one from the Buffalo Astronomical Association. The telescope was donated to UB by Miro Catipovic, a World War II veteran and master machinist who immigrated to the United States with few possessions, but eventually founded Tonawanda Limb and Brace, a successful prosthesis company. "Prosthetics requires a lot of very fine machining and sculpting," Weinstein explained. "Catipovic lost a leg in the war, so he had a personal stake in doing it well." The machinist also developed a passion for astronomy. Weinstein recalled that now-retired physics professor Gilbert Brink, a child polio victim, met Catipovic because he needed leg braces. Both Catipovic and Brink were amateur astronomers, building telescopes for their own use. Brink, who developed the astronomy course at UB, had donated to the physics department a smaller telescope that he had built for use with his son, and it was through his efforts that Catipovic agreed to donate a 20-inch telescope that he built himself, Weinstein says. The 20-inch Schmidt-Cassegranian unit that Catipovic built was valued at $85,000 when it was donated 20 years ago. "The optics are quite fineit's a superior instrument. This is probably the largest one he made; he also ground and polished the 20-inch mirror and lenses," says Weinstein. "It has four times the light-gathering power and a higher resolving power than the 10-inchyou can see smaller details on the moon or Mars, for example," he notes. Upon Catapovic's retirement, his son, Richard, took over the family business and donated $40,000 to help get his father's telescope in operation at UB. Now that the telescope is in place on the roof of Fronczak, the physics department plans to expand its astronomy program, in part through the Catipovic Observation Project http://www.astronomy.buffalo.edu/. The project is a joint effort of the department, Science and Engineering Node Services (SENS) and the Buffalo Astronomical Association (BAA) http://www.madbbs.com/~bemusabord/baa.html, which has its primary viewing site at Beaver Meadows in Java. SENS is providing the computer storage space needed to process the images and power the telescopes. Students soon will be able to write a program, or "script," that can position the telescope to view a desired object in the sky. Armchair explorers with access to a computer also stand to benefit from the project, which will make it possible to view objects in real time, with live video streaming and photographic capabilities. "On good nights, if it's clear, you'll be able to tune into the Web site and see whatever is overhead in the sky," Weinstein says. "The BAA is setting up a tracking telescope that can also be viewed from the Web site. Students and the public will be able to write scripts for what they want to observe and submit them, and with a priority system in place, on a given night they'll be able to observe and record it on the Web site. Students also will be able to do some image processing and use the images for class," he says. The budding UB-BAA collaboration is going to seek a National Science Foundation grant that, if awarded, would make these telescopes available to students and the public through the script-writing procedure. 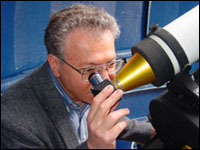 "We're going to run workshops to teach people how to write the procedures and how to use the telescopes," Weinstein says, noting that the images and data from the telescopes will be linked and organized within the SENS-administered Web site at http://www.astronomy.buffalo.edu, and will be readily accessible to individuals, students and large groups meeting in UB's computer-projection lecture halls. In order to accommodate the large numbers of students taking the Descriptive Astronomy class, students now are allowed only five minutes each on the 10-inch telescope, once per semester. The addition of the Catipovic telescope and real-time viewing via the Web site will expand opportunities to view the night sky to anyone with access to a computer. Corky Brunskill, director of SENS, and Weinstein share an interest in astronomy that dates back at least to the 1957 launching of Sputnik, the first space satellite. Brunskill remembers seeing Sputnik, but at the time was more fascinated by the telemetry coming from the spacecraft. "I was interested in electronics and built a radio to receive the early telemetry that came from Sputnik," he recalls. Weinstein remembers precisely the moment in which he developed an interest in science and astronomy. "It had to do with the launching of Sputnik. I was about 10 years old and went outside on a clear night and looked up in the sky and saw it going over. I thought, 'that's the first man-made thing up there.' There was something special about that, knowing something from Earth had gone up into the sky," he says. Around midnight one night earlier this summer, Weinstein put the Catipovic telescope through its paces, aligning it on the North Star and calculating when the Ring Nebula would appear. He then sat down and waited. "I wasn't at all sure I was going to see itI sat there and solved some equations, said a little prayer" jokes Weinstein. At 12:58 a.m., the Ring Nebula appeared, sliding into view for a mere 45 seconds, but long enough for Weinstein to take the first photos to come from the telescope. "It was very thrilling to watch it come byyou see all these stars and then what looks like a smoke ring," he says. "There's a lot of stuff up thereyou're not really limited," adds Brunskill, referring to the telescope's celestial viewing possibilities. "One of the interesting things is that during those 45 seconds, you can take a lot of photos, about five pictures a second. We have a large disk storage system SENS is going to provide for this," he says. "In a larger sense," Weinstein says, "for people who are non-scientists, being able to use the telescope is just a very mind-expanding thing. It expands their perception of their relationship to nature. When you look through the Hubble deep space telescope and see a thousand solar systems, galaxies upon galaxies, it's exciting." For amateur star-gazers hoping to get a look at Mars while it's still so close to Earth, a simple eight-inch telescope will do the job. If you hurry, Weinstein points out, you can see the icecaps.